Jammu borders Kashmir to the north, Ladakh to the east, and Himachal Pradesh and Punjab to the south. In the west, the Line of Control separates Jammu from the Pakistan region called Azad Jammu and Kashmir. Sandwiched between the Vale of Kashmir to the north and the Daman Koh Plains to the south, the Shivalik Range comprises most of the region of Jammu. The Pir Panjal Range, the Trikuta Hills and the low-lying Tawi River basin add beauty and diversity to the terrain of Jammu. The Pir Panjal range separates Jammu from the Kashmir valley. Prior to the 14th century Jammu and Kashmir were ruled by a series of Buddhist and Hindu dynasties. As Islam tightened its hold on the northwest of India, a succession of Muslim sultans occupied Kashmir until Akbar's annexation in 1587, after which it became the summer capital of the emperors of Delhi. Billawar was the capital till 1630. KM#10.1 Rupee. Year: VS 1841 RY27 (1784). Weight: 11.42g. Metal: Sliver. Diameter: 22.50 mm. Edge: Plain. Alignment: Medal, slightly rotated . 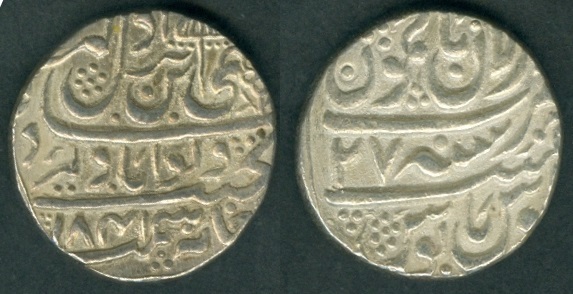 Mint: Dar-ul-Aman Jammu (Parasol mint mark). Reverse Persian legends: "سنہ ٢٧ جلوس میمنت مانوس ضرب دار الامان جموں" (Zarb Dar ul-Aman - Jammu, Sanah 27 julus maimanat manus) [Struck at Dar ul-Aman - Jammu, in the year 27 of the accession associated with tranquil prosperity]. Mintage: N/A. Minted Years: VS 1841 RY27 and VS1841 RY28 [both dates consider to be minted in 1784]. Ruler: Brij Raj Dev, but struck in the name of Ranjit Dev. Note: The reignal year (RY) used on Jammu coins is related to Mughal emperor: Shah Alam II, who ruled from AH 1173 to 1221 (1753 to 1806 CE). These coins have been minted using his regnal year from AH 1193 RY21 (1779 CE) to AH 1198 RY26 (1783 CE) and also as VS 1841 RY27 and RY28 (1784 CE). Evidently new obverse dies were produced regularly because of the need to change AH dates or mintmarks, but old reverse dies with obsolete reignal year were used until worn out. Jammu coins were produced during the rule Ranjit Dev and Brij Raj Dev. Raja-i-Rajgan Raja Kalan Bahadur Dhian Singh, born 22nd August 1796, employed in 1812 by his elder brother, Gulab Singh, as a trooper on a monthly salary of sixty rupees, in 1818 became deorhidar or chamberlain to the royal household. He took part in the battle of Naushera in March 1823. He was granted a large number of jagirs in the hilly country of Jammu, including that of Poonch in 1827, and created Raja in 1822, and Raja-i-Rajgan Raja Kalan Bahadur on 20th June 1827, and further created Naib-us-Salatnat-i-'Azamat, Khairkhwah-i-Samimi-i-Daulat-i-Sirkar-i-Kubra, Wazir-i-'Azam, Dastur-i-Mu'azzam, Mukhtar-i-Mulk, made a Wazir, principal minister or counsellor of the Sikh State 1828 to1843, married two princesses of Siba State and had children. He died 15th September 1843. Raja Hira Singh, born 1816 at Ramgarh, about 25 km from Jammu, Prime Minister of the Sikh kingdom of Lahore from 17th September 1843 to 21st December 1844 under Maharaja Ranjit Singh. Ranjit Singh conferred upon him the title of Raja in 1828 of Poonch, and of Jasrota in 1834, as well as proclaiming him Farzandi-Khas, i.e. the favoured son, married the grand-daughter of Mian Fateh Chand of Kangra-Rajgir and died on 21st December 1844. Raja Jawahir Singh, 3rd Raja of Poonch. Raja Moti Singh, 4th Raja of Poonch. Raja Suchet Singh, born 18th January 1801, in 1822. He was created Raja of Bandralta and Samba, as well as Raja of Ramnagar, he was also made the commander of the Charyari Sowars, Ranjit Singh's crack cavalry brigade. He took part in the Peshawar campaigns of 1834-1835 and 1837 and was charged with the administration of Tonk and Bannu area in 1836. In recognition of his services in the Peshawar campaigns, Jasrota was farmed out to him in July 1835, Atalgarh and Kothi were given him as jagir in December 1836, and Nadaun worth 70,000 rupees in May 1838. He held jagirs worth 306,865 rupees annually, got married, his ranis committed sati. He died on 27th March 1844 in Lahore.